The easy part of my call has been fulfilled. A rally out of that deep, oversold Bollinger Band crash was somewhat predictable, because both the bullish and bearish cases pointed to a temporary move higher before diverging. This is also why the right call to make there was for a Half Cycle Low that would be followed by a rally back to the 10 day moving average. That’s roughly where the market stands today, although obviously with a much more bullish tint to it. The harder prediction to make now is whether equities fail from this position or go on to make new all-time highs. My position remains the same, which is that past Cycles are telling us that the pattern calls for yet one more surge higher before we begin to entertain a larger, Investor Cycle top. And judging by today’s FOMC reaction and surge, I believe this outlook holds much more weight, especially when I look at the chart after the markets close. That does not necessarily mean it’s clear sailing, even though the Russell index is likely leading the markets higher today with new all-time highs. The bearish case is still potentially valid simply because there have been times in the past where big moves on FOMC days ended up being faded and served as a trap. Of course, I don’t believe that will happen here, I’m merely pointing it out because the odds are there and I want to be thorough in my analysis. In my opinion, this market is setup to surprise to the upside and prior Cycles firmly support this position. The market is far too advanced in the current IC and far too over-priced to risk a position in either direction. 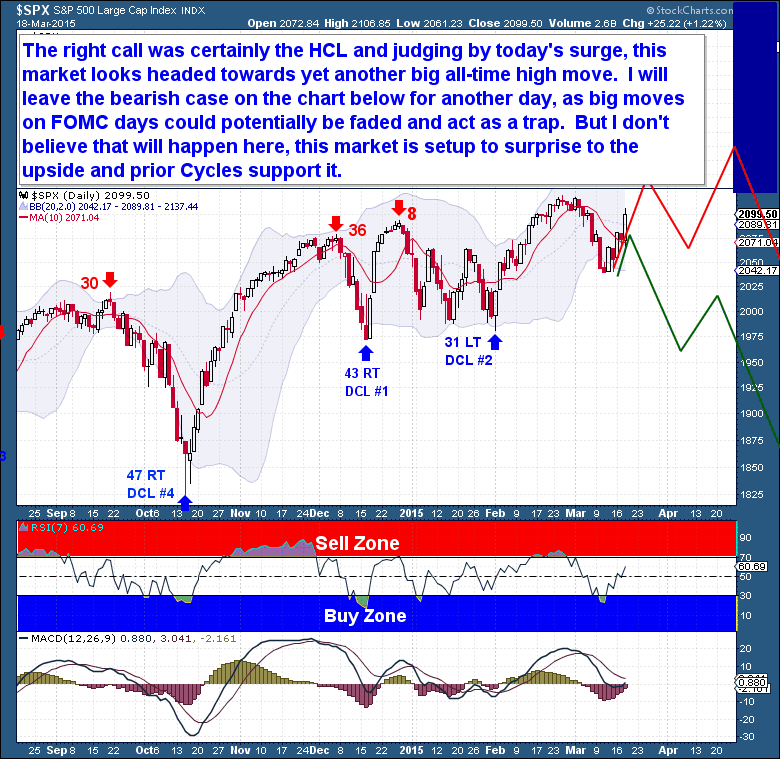 Reprint: Staying in here with positions to see where the market wants to go within the 2nd Half of this Daily Cycle. I believe it could move sharply higher and quickly from here based on how it has responded from similar positions in the past.